The creative agency Milk Studios is known for its fashion-savvy and buzzy events. And in February, it jumped into new territory when it launched its own retail product, Milk Makeup. Milk Makeup's hook is a character: the Milk Girl. Company cofounder Mazdack Rassi says this "girl" is the kind of person who takes five minutes to put on her makeup in the back seat of a cab as she’s being ferried between chic events. She's too cool to want a full makeup mask. Accordingly, Milk encourages swipes of colorful eyeliner and dabs of lip color. The vibe is experimental—a trial-and-error spirit that encourages consumers to buy a medley of simple-to-execute looks. Everything is meant to be practical: Blotting papers double as rolling papers; all products are designed to be rolled on or applied with a finger. No brushes or powder puffs necessary. 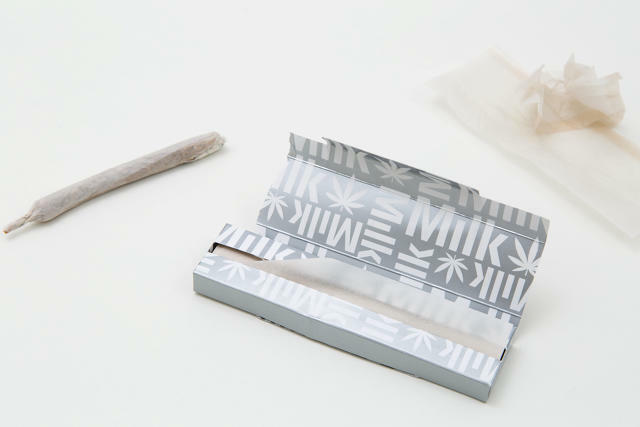 Milk Makeup's blotting papers double as rolling papers, naturally. "The tagline, 'Milk Girls do their makeup quick' was a concept I internalized into tangible products and formulas," says Milk Makeup COO Dianna Ruth, who’s worked for Hard Candy, Sugar, Hello Kitty, and Bliss. "One-handed easy application, no additional tools, good-for-you ingredients, and quick but expressive makeup." Milk Makeup's hook is a character: the Milk Girl. She's too cool to want a full makeup mask. Milk is not the first production house to launch its own line of cosmetics. Smashbox Studios, a Los Angeles photo studio, debuted a makeup line in 1996. But Milk’s new venture is less an extension of its photo studio and more representative of niche brand power. Big brands like L'Oréal, Clinique, and Revlon no longer dominate the entire market. Small cosmetics companies are breaking through. "People want to know that they have something special," says Karen Grant, global beauty analyst at the NPD Group. Last year, the market analytics firm noted big growth for independent prestige beauty brands. Among the top five growth companies for 2015 were three independents: Anastasia, Too Faced Cosmetics, and IT Cosmetics, which sold to L'Oréal for $1.2 billion this year. The key to the 85-piece line is simplicity and spontaneity. Grant says one of the big reasons freestanding makeup labels are getting so much love is because of a change in shopping attitudes. Consumers are trusting individual products rather than committing to one brand. Makeup companies no longer have to have everything, she says, they just have to have that one sought-after product: "It’s less about having a wide array than having something that they’re known for. Anastasia Beverly Hills Beauty and Cosmetics, founded in 1998, has been successful because of its focus on eyebrow products, for instance. 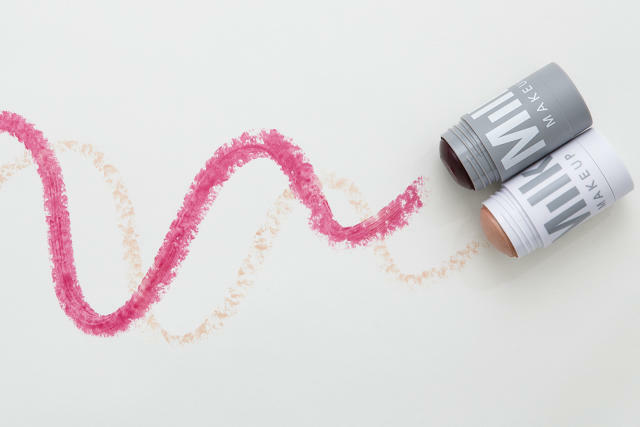 This phenomenon has paved the way for newbies like Kylie Jenner, whose line of neutral matte lipsticks sold out in 30 seconds last year. But it’s not just consumer values that have changed. The rise of beauty vloggers, Twitter, Facebook, and Medium are also a contributing factor. In September, NPD reported that more people were turning to the internet for makeup advice than print or broadcast. Makeup users largely rely on trusted friends or word of mouth to source new products, but what defines a friend may depend on how old you are. For millennials, friendly tips come from social media feeds and YouTube videos even despite complaints that these high-paid "influencers" are just part of the corporate machine. The report says the internet is one of the top five channels for buying makeup, ranking "just below department stores but ahead of direct sellers, national chains, and beauty supply stores." Which means social media is now a key marker of success and relevance. According to a new report, Jenner’s cosmetics have appeared in social posts more than 1.3 million times since launching in October 2015. Compare that with Estee Lauder’s mere 373,000 mentions. Online is also where makeup buyers are increasingly going to shop, according to NPD. For the 12 months ending in October, online makeup sales were up 36% compared to 13% for retail sales. Since Milk Girls "do their makeup quick," every product is designed to be rolled on or applied with a finger. "Like my 15-year-old niece, when I was with her in Minneapolis, she comes home and goes straight up to her room, does her homework, then goes on YouTube," says Milk cofounder Rassi. In order to appeal to this generation, Rassi tells me, he’s trying to become part of it. He spends nights reading blogs and watching vloggers talk shop and monitors how these reviews affect sales. He says a vlogger reviewing Milk’s products out of Ohio can lead to the sale of hundreds of lipsticks in a given evening. "And then Vogue will talk about [us] and we’ll sell four," he says. Rassi knows the fashion world well. His wife, Zanna Roberts, a senior editor at Marie Claire, partnered with him on Milk’s nascent line. And Milk Studio's connection to the New York fashion elite is well established. On any given day, you might see photographer Terry Richardson or Annie Leibowitz walking its hallways. The studios also host Vogue cover shoots as well as Fashion Week runway shows from the likes of Proenza Schouler and Chromat. "People show up on our doorstep and they just want to make stuff," Rassi says, hunched over a low coffee table stacked tall with thick art books. He is very tall and I am very short, and I imagine he’s trying to create more intimacy in the conversation by leaning in. We’re sitting in his white-walled former warehouse office space where sunlight streams in through skylights in a vaulted ceiling. The walls are covered with skateboard decks and giant photographs, most recognizably, a portrait of Kate Moss from her Calvin Klein days and Steve McCurry’s Afghan Girl. A vlogger reviewing Milk’s products out of Ohio can lead to the sale of hundreds of lipsticks in a given evening. It’s this culture of art-chic cool that Rassi has tried to inject into his makeup brand. In an introduction video, Milk defines the brand as encompassing "punk fashion," "art kids," and "the next generation"—or Gen Milk for short. As for the "it" Milk Girl, she certainly doesn't adhere to binary definitions of gender. The company's website features a diverse set of women and men to represent the Milk Girl. There are three men among Milk’s lookbook of 47 "girls," one of whom is transgender. So far, about 5% of Milk Makeup's customer base is male. 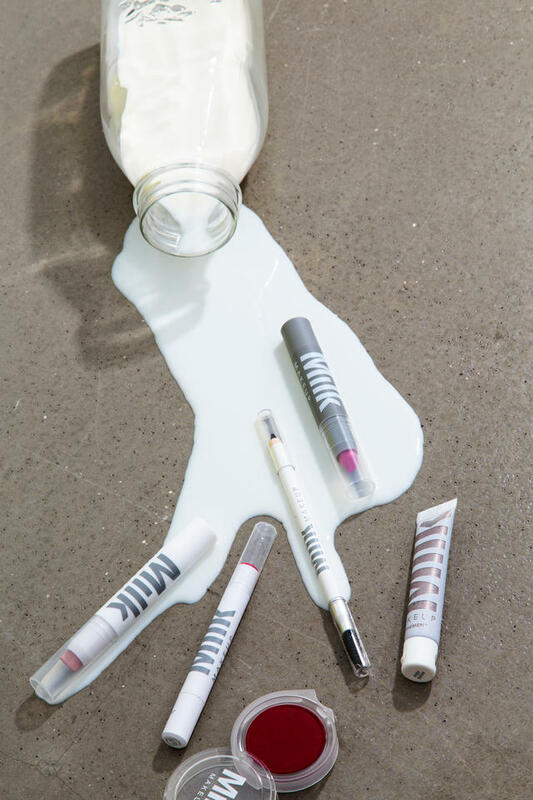 Milk Makeup is sold at Sephora and Urban Outfitters. Milk doesn’t yet have the reach of its similarly minded competitors like L'Oréal’s Urban Decay and LVMH’s Kat Von D Makeup. Last year, L'Oréal’s cosmetics brands generated $6.06 billion in annual revenue; Estee Lauder, $4.2 billion. Milk, a private company, hasn’t released revenue figures, but momentum seems to be strong. When it debuted, Milk sold out of its signature Holographic Stick in a month. Its Cooling Water stick followed, selling out in two months along with three other products, suggesting that Milk might be capable of creating the "it" products Grant mentioned earlier. 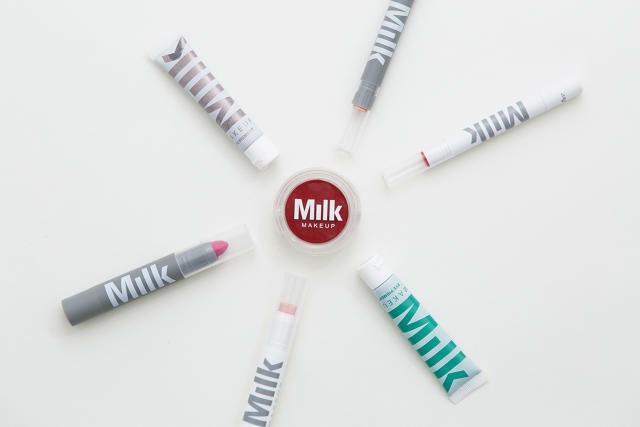 Milk Makeup is now sold in 100 Sephoras and 50 Urban Outfitters around the country. What does growth look like moving forward? It could mean being scooped up by one of those massive brands. "The big guys are on an acquisition binge," Grant says. "When you are hot and they feel you can add a unique dimension to their portfolio, they are going to acquire you." Beauty-brand acquisitions are up 44% this year, according to CBInsights. Revlon, L’Oréal, Estee Lauder, Unilever, and Johnson & Johnson are among the biggest acquirers. If Milk can prove its makeup brand can pump out must-have products to a devoted younger audience, it could win big in a sale. Though Milk Studios is familiar with this process—last year, it sold its MADE Fashion Week incubator to WME IMG—Rassi says he's not looking to break off the cosmetics branch just yet: "At this point, less than a year in, our No. 1 priority is to grow the company and scale."